The UN Human Rights office, the UN peacekeeping mission in Libya have condemned the violence, as did the European Union while underlining that the ICC can prosecute those responsible for grave human rights violations. Last week, Amnesty International criticized both factions fighting in Tripoli and Benghazifor the indiscriminate shelling of civilians and called for its immediate stop. 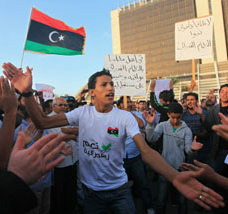 Lawyers for Justice in Libya commended the formation of the new government, urging them to end the violence and take action against those who have committed atrocities. Libya was referred to the ICC prosecutor for investigation by the UN Security Council in 2011. Visit our Libya webpage for more information. The UN Secretary General released a report of the current situation in CAR to the UN Security Council and urged civil help with the deteriorating security situation and increasing violence. The Seleka rebel group stated that they did not support the decision to appoint Mahamat Kamoun as prime minister but promised their cooperation in the continued peace process. The UN Office for the Coordination of Humanitarian Affairs sent an assessment mission to the location of fighting between Seleka rebels and anti-Balaka militia and found that 20,000 more people have been displaced as a result. Data from the UN refugee agency found that fewer CAR refugees are escaping for neighboring Cameroon because of the malnourishment and violence from the harrowing trip. The defense teams of Deputy Kenyan President William Ruto and journalist Joshua Sangannounced efforts to file a motion that may push the ICC judges to determine the cases before the end of the year. The trial is set to resume on 1 September. The Kenyan government has reportedly compelled nine reluctant witnesses to testify in the case. A UN Security Council delegation briefed President Kenyatta on the peace process for the fighting parties in South Sudan and Somalia. African Union and UN Special Envoy Mohamed Chambas briefed the UN Security Council on the increase of displaced persons and growing hostilities in Darfur, suggesting that President Al-Bashir’s proposal for a national dialogue could offer a solution. Chambasstated that inter-communal violence and reducing humanitarian aid continue to be major issues for the displaced in Darfur. The Sudan Liberation Movement armed rebel group attacked and raided a government military base that left 17 troops dead. The UN condemned a government military raid on a displaced camp in South Darfur, citing that weapons are banned from the refugee camps. Tribal tensions and fighting in the East Darfur state have have hindered the formation of a new government. The UN human rights division’s Scott Campbell hailed the trial of ex-army officer in eastern DRC as a precedent for justice. The UN Security Council held a briefing on DRC’s security situation, stating that there has been some progress but the situation is still delicate. Fighting between DRC troops and an armed group left eight residents dead and evacuated much of Medecins Sans Frontieres’s staff, causing them to temporarily abandon a measles vaccination campaign. UN Mission Chief Martin Kobler gave Rwandan rebels in the DRC six months to disarm or face possible military actions, and condemned the killing of six family members that put the peacekeeping mission on alert for the escalating violence in the area. Chief Executive Officer Mohammed Ndifuna of Human Rights Network Uganda gave an interview detailing 20 years of fighting for human rights, giving credit to the Ugandan Coalition for the ICC as one of their most successful programs. Ugandan government troops rescued 58 women and children abducted by Lord’s Resistance Army (LRA) rebels after fighting in the DRC. Studies from Conciliation Resources as well as from other experts found that ex-LRA soldiers struggle to re-integrate into their lives back at home due to trauma and the community’s distrust of their past connections. Algeria announced that peace talks between Tuareg-led rebels and the Mali governmenthave been suspended until 1 September. Mali President Keita announced concern that the lack of air surveillance in North Mali could allow criminals to utilize it as a base. French troops bombed areas of North Mali, following reports that al-Qaeda insurgents were active in those locations. Director of ICTJ’s Colombia branch Maria Moreno discussed the criticisms and possibilities of the peace process between the Colombia government and rebel armed forces. Meanwhile, Colombian President Juan Santos warned the FARC rebel group that the peace talks could end if FARC continues attacking citizens. The talks resumed on Tuesday. Leader of FARC Rodrigo Londono announced that the militia will accept the punitive repercussions given to them after the peace talks are finalized. Londono alsoannounced that the rebel group will likely not reach a final peace agreement with President Santos by the end of the year. The Nigerian Coalition for ICC called on the country’s national assembly to pass an international crimes bill. More than 100 Nigerian civilians and troops have died as insurgent group Boko Haram attempts to invade areas of Northern Nigeria. Reports said that the insurgent group have possibly abducted 100 boys and young men and left ten dead in their most recent attack. At least 400,000 civilians have been displaced due to the violence. The families of thousands of Afghan civilians killed by US/NATO forces in Afghanistanhave been left without justice says Amnesty International in a new report. The American Non-Governmental Organizations Coalition for the ICC analyzed U.S. federal cases that have discussed the Rome Statute in the law process and the importance this may have for US courts acknowledging international law as an authority. Human Rights Watch (HRW) condemned the alleged attacks on Gaza’s electrical power plant as attacks aimed at harming civilians. Amnesty International urged civil society to increase humanitarian aid and support for those escaping or trapped by armed group ISIS. HRW released a report on the allegations of human rights violations in South Sudan by both the government and opposition groups and called on the UN Security Council to establish an arms embargo as well as appropriate sanctions. The Council finished its assessment of South Sudan’s situation, concluding that the country has fallen into violence and chaos. Palestinian Presidential Advisor Al-Aouri rebuked claims that Foreign Minister of Palestine Al-Malki requested ICC Prosecutor Fatou Bensouda to nullify the complaints of war crimes against Israel. The UN announced that an independent team has been chosen to investigate allegations of human rights violations committed in Gaza. Academic William Schabas refused to step back as the lead of the investigation despite calls for him to stand down. Meanwhile, Israeli Prime Minister Benjamin Netanyahu reportedly met with a delegation of U.S. lawmakers to discuss the Gaza conflict and to ask for assistance in staying out of the ICC. HRW released testimony from Syrian ex-detainees that they suffered alleged torture and called for the government to allow independent investigations into its detention facilities. FIDH called on the UNSC to protect those in North Iraq most vulnerable of violence from armed group ISIS. Physicians for Human Rights outlined the exciting opportunities for ending sexual violence in conflict in a new international protocol launched at last month’s Global Summit in London. Blogger Mark Kersten reviewed academic David Bosco’s new book Rough Justice.